Deal pipelines can be used to predict revenue and identify roadblocks in your selling process. Deal stages are the steps in your pipeline that signify to your sales team that an opportunity is moving toward the point of closing. Keeping track of your deals progress in your deal pipeline gives you a more detailed picture of your projected revenue for a given time. In the left sidebar menu, navigate to Sales > Deals. In the Deal Pipelines and Stages section, you can view and edit the structure of your current pipelines or create a new pipeline. To edit the stages in one of your existing pipelines, click Edit next to the stage. To create a new pipeline, click + Add another pipeline. Please note: only Sales Hub Professional or Enterprise users can create multiple pipelines. 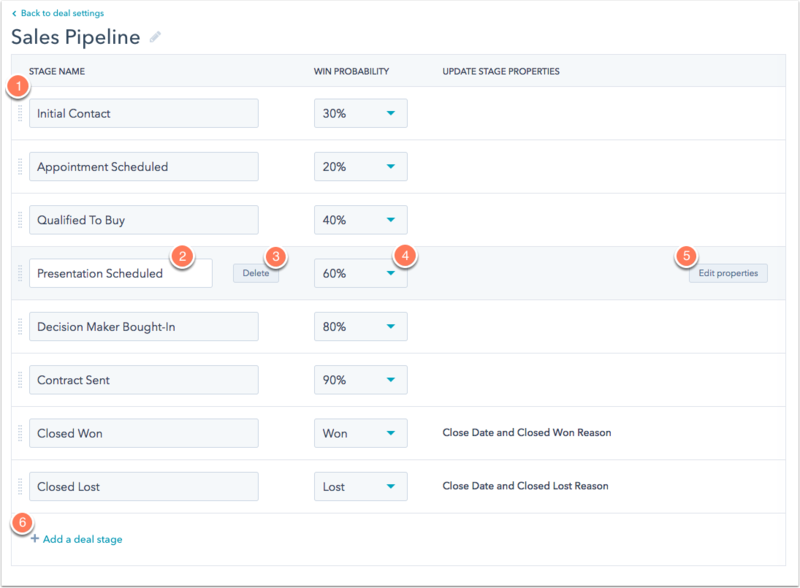 If you have not installed the HubSpot-Salesforce integration, it is possible to create up to 50 deal pipelines as a Sales Hub Professional or Enterprise user. Using deal stages, you can categorize and track the progress of the deals that you're working on in HubSpot. Each deal stage has a probability associated that indicates the likelihood of closing deals marked with that deal stage. In the Deal Pipelines and Stages section, click Edit next to the pipeline to customize the stages. To change the order of a stage in the pipeline, click and drag the stage. To change the name of any stage, click the Stage name field. To delete a stage, hover over the stage and click Delete. To change the probability of closing a deal at that stage, click the Win probability dropdown menu and select an option. You can also create a custom probability (e.g., 76%) by entering a custom probability in the search field, and clicking Add option. The probability must be an integer and below 100. To edit the deal properties presented for users to fill in when a deal is moved to this stage, click Edit properties. To create a new deal stage, click Add a deal stage and set the stage name and win probability. Any newly created deal stages will appear in the deals view for all users in your account. If you're deleting a deal stage that contains at least one deal, you'll be prompted to move these existing deals to another stage. Sales Hub Professional users can also automate tasks on deal stages when editing or creating a sales pipeline. Please note: you must have permission to edit property settings to update your deal stage properties. Hover over a specific deal stage and click Edit properties. Use the field on the left to search for the property or properties you'd like to add, then click the checkbox to the left to select that property. To require a value for property, click the checkbox in the Required column for that property on the right. You can then click Preview popup to preview what your CRM users will see when they move a deal to this stage. Once you've set up your deal stages and added any required properties for moving between stages, click Save in the bottom left. Your pipeline will now appear in the Pipeline dropdown menu on your deals dashboard.